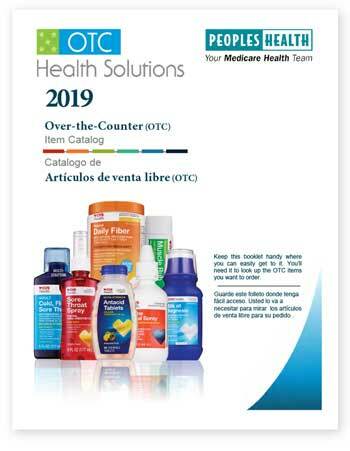 New for 2019 is our over-the-counter benefit! This benefit is only offered by certain plans. If your plan offers the benefit, you receive an “allowance” to spend on items you can use to stay healthy. You pay a $0 copayment for over-the-counter health-related items and non-prescription medications. Not a Peoples Health member? Click here to learn more about our plans. Peoples Health Group Medicare (HMO-POS), Peoples Health Group Medicare (HMO-POS) for Office of Group Benefits and Peoples Health Secure Choice #011 (HMO SNP) do not offer this benefit. What items can be purchased with the OTC benefit? Categories of covered items include vitamin and minerals, as well as products for allergies, colds, digestive health, eye care, first aid, incontinence, oral care, pain relief, personal care, and foot care. What is considered a quarter? Each quarter of the year is divided into the following three month increments: Jan. 1 – March 31; April 1 – June 30; July 1 – Sept. 30; Oct. 1 – Dec. 31. How do I order my OTC items? Items can be ordered online or by phone. Up to three orders may be placed per quarter; the combined total of the orders cannot exceed the plan’s quarterly maximum amount. Any unused amounts in a quarter will not carry over to the next quarter. The items will be delivered within seven to 10 business days. Items must be purchased from the network mail-order provider.